Reduced installation time and less disruption to work space as compared to traditionally built walls. Integrates with existing light and HVAC designs. More durable than traditional office partitions. 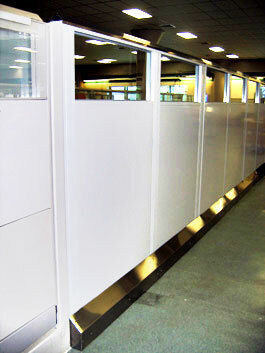 The freestanding wall support is the anchor for any free standing wall partitions using the OmniFlex system. This base plate connects floor tracks that support the wall with floor anchors and the OmniFlex support columns. The freestanding wall support is easy to install and enables companies to create walls that are not anchored to any existing load bearing walls. Read about some unique applications for PortaFab wall partitions.